need to use scissors (included) cut part of them at first,otherwise the clippers will jam up and don't work properly. With 2 Li-Lion batteries, with this rechargeable design, you no longer need to replace batteries or boring wires. It can also be used on the power line. If the power is off, you can connect the plug to the clipper and modify it. Please don't forget to clean the blade and the internal head after using. 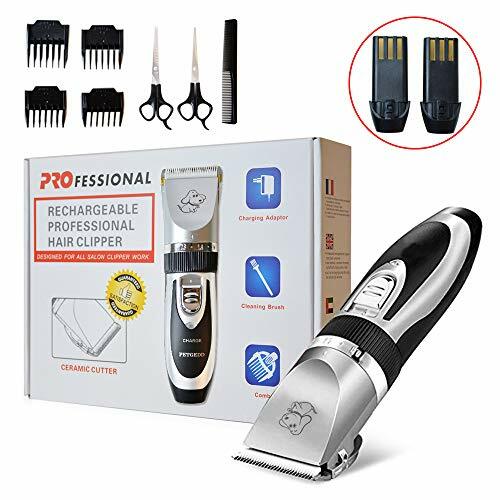 DOG GROOMING KIT - This dog clippers pet grooming kit has 12 tools : 1 × Pet Clipper, 2 × Li-Battery (Only we have) , 1 × Charging Adaptor, 1 × Cleaning Brush, 4 × Comb Attachments (3/6/9/12mm), 1 × Dog Grooming Scissors, 1 × Comb, 1 × Dog Grooming Thinning Scissors. Fit for all hairy pets! Some accessories are underneath the case on the bottom. LOW VIBRATION,LOW NOISE AND LIGHT WEIGHT - Precision motor with special denoise technology, reduce noise to below 50db (equal to ambient noise),which helps pets feel at ease and not afraid of hair cutting any more. ADJUSTABLE, PRECISION-CUT BLADES & COMFORT COMBS - PetGedd's grooming combs are contoured for the most skin-friendly grooming experience, and thanks to the Precision-cut titanium blades, there's no uncomfortable pulling at your pet's hair. Just a safe, easy and comfortable grooming experience! Detachable blades,easy to change and clean. POWERFUL UNBLOCKED - This powerful dog grooming kit can be used for all furry coated pets and will save you hundreds of dollars over the lifetime of your pet - money that you can spend on their food and vet care. LIFETIME REPLACEMENT GUARANTEE - We're so proud of the quality of products we manufacture, that we're proud to stand by our unparalleled lifetime replacement guarantee. If you ever have any issues with your pet grooming kit, simply contact us for a free replacement or refund. If you have any questions about this product by PETGEDD, contact us by completing and submitting the form below. If you are looking for a specif part number, please include it with your message.